Self Help is a community development finance institution and non-profit real estate developer. 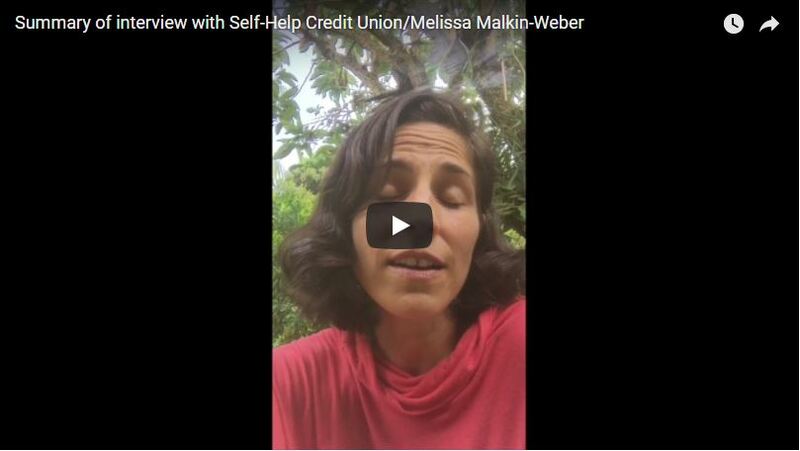 Self-Help Credit Union is very unique. It is a community-serving financial institution that invests in sustainability projects across the country and its mission is to create and protect ownership and economic opportunity for all. By providing responsible financial services, lending to small businesses and nonprofits, developing real estate and promoting fair financial practices, the credit union is in a position to support communities of all kinds. I love that this credit union has a focus on those who may be underserved by conventional lenders, including people of color, women, rural residents and low-wealth families and communities. Self-Help has consumer branches in North Carolina, California, Chicago and Florida. Many Self-Help members in other parts of the country make deposits in Self-Help’s socially responsible certificates of deposit and money market funds. They earn interest while supporting Self-Help’s mission of “Economic Opportunity for All”. You can read more about their sustainability efforts here: www.self-help.org/green. Melissa Malkin-Weber is the Sustainability Director and is responsible for the actions of the Environmental Stewardship Committee. She also oversees the sustainability initiatives for the credit union.